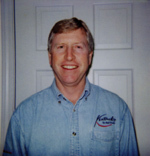 FLORENCE, Ky. (May 2003)  Thousands of travelers enter Kentucky each year by way of interstate highways. A substantial percentage of them are tourists, and one of the first stops many of them make is at a Welcome Center. The Kentucky Welcome Center in Florence, Ky., is one of eight in the state serving thousands of travelers annually. Were like a funnel if you look at where were located, said Welcome Center director Jeff Thoke, a Pendleton, Ky., resident. The center, located just 15 miles south of Cincinnati at Exit 177 on the southbound side of I-71/I-75, serves as the primary gateway into the states north central section. The convergence of two major interstate highways, I-71 and I-75, near Florence generates a steady stream of traffic through the area each day. The centers traffic, which can range from 150 to 1,000 visitors daily, is composed primarily of travelers from the northern tier of states and Canada, said Thoke. The center also serves a wide variety of international tourists entering the area from the Cincinnati-North Central Kentucky Inter-national Airport, located six miles to the northwest. At the Welcome Center, Thoke and his staff provide information to travelers about various attractions across the state. What we do when they ask about what they can do in Kentucky is ask them about their interests, Thoke said. Where visitors head after they leave the center, according to Thoke, depends mostly on what they like to do and how long they plan to be in the state. After asking a few questions, Thoke said he can usually make appropriate suggestions. From natural resources like Mammoth Cave National Park to bustling cities such as Louisville and Lexington, Kentucky is not short on options for travelers. Tourism is Kentuckys third largest industry, according to the states Tourism Development Cabinet. In 2000, the industry brought in $8.8 billion to the state, said Barbara Atwood, assistant director of marketing and advertising at the State Department of Travel. The Department of Travel compiles statistical data regarding tourism in the state and offers free travel information via their website: www.kentuckytourism.com and toll free number, 1-800-225-8747. Both Atwood and Thoke said they have noticed changes in tourism patterns over the past couple of years. Rather than planning vacations five or six months in advance, said Atwood, travelers have shown a propensity toward spur-of-the-moment travel. People are more flexible and may decide last minute, she said. In order to cater to this change, the Department of Travel is currently working with travel-related businesses statewide to promote last-minute specials and package offers. How the information will be related to potential travelers is still in the development stages, but the department hopes to have a marketing plan in place sometime this summer. Along with more impulsive travel plans, Thoke said that many of the travelers he meets are taking shorter vacations. The trend that we see is that more and more people are taking long weekends. Fewer people are taking week-long or two week vacations, Thoke said. 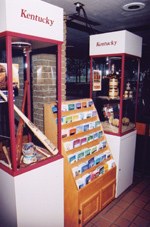 To help travelers get the most out of their trips to Kentucky, whether they be short or long, the Florence Welcome Center has several hundred brochures, free state maps, coupons and literature about the state. Thoke and his staff are also available from 8 a.m. to 6 p.m. daily to assist with directions and travel-related questions. The Welcome Center will celebrate National Tourism Week, May 10-18, with a race car display from Kentucky Speedway in Sparta, Ky., and with demonstrations by a Kentucky craftsperson and Abraham Lincoln re-enactor. The Welcome Center isnt just for tourist, however. Local residents are urged to stop in to sample the fare and pick up literature about their home state, Thoke said.